The star of many talents is throwing caution to the wind — and the censors — on his quest to shake up China’s talk shows. It’s hard to pin a label on 28-year-old Liang Huan: He’s a musician, a talk show host, and a film director. He’s also a basketball critic and commentator, an app developer, a defender of intellectual property, and a crusader against lip-synching in music. But more than all of this, he’s one of China’s foremost online stars. At the start of the decade, Liang became popular for writing commentaries on his blog on a popular basketball forum. 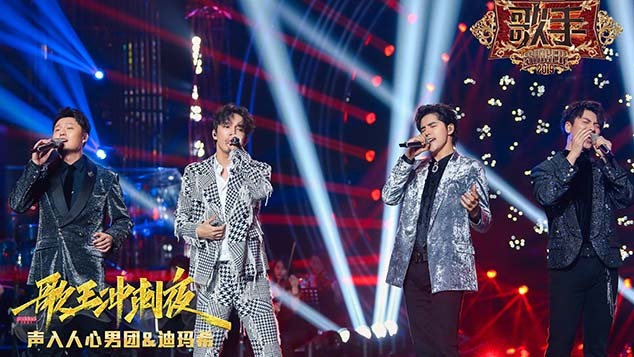 Since then, he has taken aim at pop stars and bands for lip-synching and bad singing, written a chart judging singers by skill that went viral, and campaigned against plagiarism in music, all through his Weibo account. All of this has brought Liang over 1.8 million followers on the microblogging site, as well as a host of enemies among the fans of artists he has offended. But Liang is showing no signs of slowing down. In April, he launched what he has called China’s first American-style talk show. Called “The Vicious Liang Huan Show,” the program is modeled on shows like “Saturday Night Live.” Although the series has been watched over 25 million times across all 12 episodes, Liang has been criticized for his awkward hosting style. In a bizarre move for the final episode, Liang conducted a lengthy, self-effacing interview with himself to address these concerns. 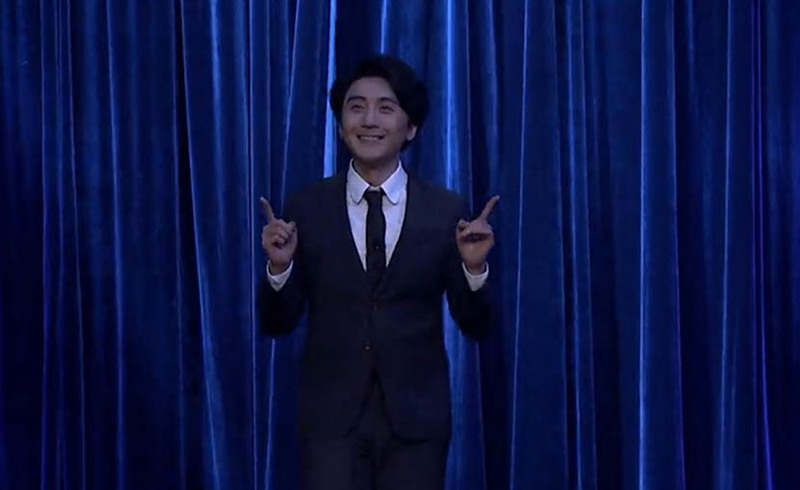 A screenshot from ‘The Vicious Liang Huan Show’ shows host Liang Huan appearing on stage with a smile. Liang also released a full-length music album in September. The album’s experimental electronic sound is a deliberate and dramatic departure from his more traditional, poppy debut EP from 2014. It’s a typically headstrong move from Liang, who is surprisingly self-aware and talks intelligently and freely on a wide range of topics. He spoke to Sixth Tone about juggling his roles, battling plagiarism, and the difficulties of finding subjects to mock on TV that won’t offend the country’s media watchdogs. The interview has been edited for brevity and clarity. Sixth Tone: You started calling out lip-synching popstars on your Weibo account in 2011. Why? Liang Huan: Whether it’s lip-synching or plagiarism, the problem is that the music industry in China is one of the worst anywhere. Copyright protection has been really bad, and it is hard to make any money from music, which prevents talented people from entering the industry. So instead, the industry attracts people with less and less talent, creating a vicious cycle. Above all, singers don’t have a problem with lip-synching, the TV stations don’t have a problem with it, concert promoters don’t have a problem with it, and the listeners think it sounds good — so they don’t have a problem with it either. This has resulted in poor live performances across the board from Chinese musicians. Sixth Tone: You’ve also taken a stand against plagiarism, such as accusing Da Zhang Wei of plagiarizing German electronic musician Zedd. What is the situation like in China for plagiarism these days? Liang Huan: Plagiarism in China is extremely common. In the West, plagiarism can mean borrowing a hook, or a groove, or a harmonic direction. In mainland China, things are different: Timbre, harmony, and rhythm are copied wholesale. I think it’s because when it comes to music, we are still in an imitation stage. Plagiarizing is just too easy for people who aren’t creative enough. My team and I are taking ideas that have come before, adding our own new elements, and making something totally new with them, so that listeners think, “Whoa, I never thought these things could be combined this way.” It’s an expression of your respect for the listener. But if you aren’t creative enough, then you don’t know how to add things — so you just copy. I totally fucked up the first three episodes, but I have my reasons for that. Sixth Tone: Your new album is very different from your debut EP. Why the new direction? Liang Huan: When I released my first EP of five tracks, it was all the traditional styles of pop music. It sold quite well, but I thought it was a failure, and I wasn’t happy with it for a very simple reason: I don’t listen to those traditional ballads or love songs, so naturally I don’t have an appreciation of them or the ability to critique them. I decided not to make music I wouldn’t listen to again, and chose to focus on the music I do listen to because, at the very least, I’m better at judging it. But the cost for me is that listeners can’t accept it as easily. But that doesn’t matter. I didn’t sign with a label for this album; I used my own money, and I’m financially responsible for it. I knew while recording it that it wouldn’t make any money, and I was really happy with having things that way. Sixth Tone: How close is “The Vicious Liang Huan Show” to the American-style talk show you claim it to be? Liang Huan: Talk shows should take a stand on things that are happening in society. But in China this is really hard. For example, I need to revise every script I write for the show over and over. There are so many topics that the producer tells me during meetings we can’t mention. Then there are topics the producer lets through but the website’s approvers object to, so I have no choice but to change the script again. Our method is simple: Be cooperative, but try again next time. Sixth Tone: How on earth do you make a good talk show under those conditions? Liang Huan: The best subjects to make fun of for talk shows are always politics and entertainment. In China, we can’t talk about politics much. We circumvent it and talk about show business instead. But as for the scale, we explore it step by step. Take my own experience as an example: My tenet is that if the topic could cause the show to be taken down, I would change it. I am very cooperative, and I will change things promptly. However, the next time I will still try it anyway, because I find that while some topics can’t be mentioned in the first episode, it will be OK to bring them up in the fourth or eighth. In fact, we’ve had no trouble so far when making fun of leaders at the town or county levels. But I don’t know when, if we say things about a city mayor or governor, it is not going to be OK anymore. First, I will usually suggest talking about a potentially sensitive subject, just to try it out. Then we’ll see what those screening the series say when we send the script to them. Our method is simple: Be cooperative, but try again next time. Sixth Tone: Are there any talk show hosts whom you would consider role models? Liang Huan: Yes, I’m a fan of Seth Meyers. I hope “The Vicious Liang Huan Show” can become something like a cross between “Late Night With Seth Meyers” and “Last Week Tonight With John Oliver.” I hope to find a balance between those two. Sixth Tone: You have faced some criticism from your performance in the show’s first season. How would you evaluate your performance during those episodes? Liang Huan: I totally fucked up the first three episodes, but I have my reasons for that. The preparation for the first season was too rushed, and I only had two weeks to prepare. Also, we didn’t work together well when writing the scripts. After the fourth episode, I wrote most of the scripts myself and didn’t have any time to hone my acting skills. When I woke up the next day after shooting, the first thing I thought about was that I still had to write 50 more jokes and a social science essay. We will hire more script writers to free me up for the second season. There are no artists in show business who don’t get sworn at. Cyber-bullying happens all over the world, not only in China, and not only to me. Sixth Tone: Recently the online show “Roast Convention,” which took inspiration from Comedy Central’s celebrity roasts, was taken offline by state media regulators. What does the future hold for China’s satirical shows? Liang Huan: The current situation is that censorship is always a knife hanging above our heads. The scariest part of the knife is that it is moving randomly and not fixed at the same point. This means we don’t know where the boundaries are, and all we can do is try to stretch them. For example, if I can push the limit of what is acceptable, the next person who hosts a talk show could continue exploration based on any new trails I blazed. Sixth Tone: You made a name for yourself on the internet and social networks. How do you deal with all the negative comments you face on a day-to-day basis? Liang Huan: Every time I exposed a singer for lip synching or plagiarizing, I would receive hundreds of thousands of messages of abuse on Weibo. This is no exaggeration — China has an enormous number of fans. My aim is always to clear things up, so I’m talking to the people who want the truth, not the fans. That’s why I don’t care about the abuse. Plus, there are no artists in show business who don’t get sworn at. Cyber-bullying happens all over the world, not only in China, and not only to me. With contributions from Lu Hongyong, Lin Qiqing, and Yan Jie.